Opened last year, Suvlaki is an Athenian Grill located in the heart of Soho, unsurprisingly specialising in Greek street food – Souvlaki. Set up by Greek celebrity chef Elias Mamalakis, the restaurant recently brought Alfred Prasad on board as consultant chef: having become the youngest Indian chef to receive a Michelin star in 2002, while he was working at iconic Indian Restaurant Tamarind of Mayfair. And since joining the kitchen, Prasad’s take on quintessentially Greek moussaka has become a hugely popular vegetarian addition to the menu. 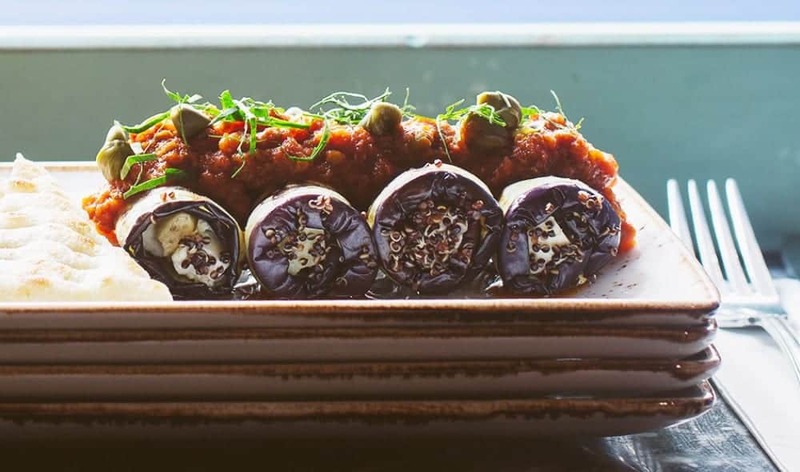 Made using aubergines, Mastelo cheese, courgette and black quinoa, here’s the recipe for the dish, in order for readers to attempt to recreate at home. In a saucepan, heat olive oil and sauté the chopped garlic and bay leaves, sauté over low heat for a couple of minutes; add the chilli flakes and paprika, sauté for 30 seconds. Throw in the chopped tomatoes, tomato paste, sugar and wild oregano and simmer over low heat for 30 minutes, add the capers and salt. Check seasoning and set aside. In a saucepan; add the quinoa and 2 parts of water, bring to a boil and simmer over low heat for 15-20 minutes (until most of the water has evaporated). Transfer to a shallow bowl and leave aside. Trim the top and bottom of the aubergines and cut lengthwise into 5mm thick slabs; trim the ends of the courgette and cut into 5mm thick slices (again discarding the skin on both ends). Grill the slices without oil, for a couple of minutes on each side and set aside. To prepare the rolls; trim the Mastelo cheese into 5mm thick slices and then again into 5mm thick batons. Drizzle olive oil on a sheet of baking paper over a flat surface, place the slices of aubergine on it and spread a thin layer of the moussaka sauce on the slices (discard any bay leaves). Sprinkle the cooked quinoa over the sauce and place a slice of courgette topped with a baton of Mastelo cheese at one end of the aubergine slices, sprinkle with salt and roll. Stack the rolls with the loose end underneath to hold in shape. Double over sheets of kitchen foil into approximately 8”x10” rectangles. Place a spoonful of moussaka sauce on the foil sheets and arrange 4-5 rolls per portion. Fold over and seal the ends into individual parcels and re-heat on the BBQ/Grill for about 8 minutes or until heated through. Pierce the parcels away from you to release any steam, carefully open the parcels and lift the rolls onto a serving plate. Top-up with any remaining moussaka sauce and serve garnished with wild oregano and a few sprigs of parsley. Suvlaki can be found at 21 Bateman Street, London, W1D 3AL.